Hyperion team makes final adjustments to rover before its record-breaking run on the terrain task. "Out of 500 possible points, they scored 493 — the highest-ever score at URC!" said Kevin Sloane, director of the challenge. Another Polish team, Scorpio 3 from the Wroclaw University of Technology, took second place, with 401 points. Brigham Young University placed third, with 350 points. For most teams, the toughest challenge was simply getting their rovers to move. "Driving over bumpy dirt roads just to get out to the MDRS can damage parts. One loose wire can mean the entire system fails," said Chuck McMurray, the Mars Society's deputy education director. After the first day of the three-day competition, most teams had repairs to make. Many stayed up all night working along the narrow walkways in front of their motel-room doors. The defending champions from York University in Toronto had brought their MakerBot 3D printer. It hummed along in a corner of the bathroom for hours making replacement parts for the rover's robotic arm. Many teams used 3D-printed parts, and judge Anne Andersen, a biologist from Utah State University, said that 3D printing will become as important an invention to the world as the transistor. Each rover had four timed tasks to tackle in the desert and around the Mars Desert Research Site: servicing equipment, assisting astronauts, collecting samples and navigating a rough-terrain obstacle course. "On Mars, it will be a lot easier to send a robot out to fix equipment or deliver supplies than sending out another astronaut," Sloane said. And because rovers on Mars would likely be controlled by those back at a base station, the same restriction was placed on the teams who set up their command centers in trailers out of view of the competition field. The rovers looked similar — knee-high vehicles with articulated robotic arms, specialized suspension systems for navigating rocky terrain, cameras to provide a video feed, and a telecommunications system to communicate with the command center. Each team added its own selection of scientific instruments and other accessories to accomplish the tasks. The equipment-servicing task demanded the most precision. After a 25-minute setup period, teams sent their rovers out to a PVC box designed to represent a solar panel . McMurray used a flour sifter to cover the panel with dirt. After flipping a series of light switches — a no-brainer for a human, but difficult for a robot — the rovers were repositioned to use their arms with an attached device to clean the panel. Oregon State's rover used pieces of a Swiffer duster and a pair of ice scrapers for the job, while Hyperion blew the dirt away with a high-powered fan. Scorpio 3 used a rotating brush that worked well until it fell off — the direction of the spin also unscrewed the brush. Scorpio 3 uses its brush attachment to clean the solar panel. For this challenge, four scarecrows dressed as astronauts were placed out in the desert, beyond sandy ridges and ravines that blocked them from view. The rovers had to deliver four numbered packages to the corresponding astronauts . Akers, the rover from the Missouri University of Science and Technology, got stuck on a soft sandy hill — its wheels spinning in a circle as the chassis sunk in the sand. Team members rescued the rover, carrying it back like pallbearers at a funeral. Life-sciences students had important roles to play in the sample-collection task. Rovers had to obtain a sample from at least two inches below the ground, perform onboard testing for signs of life and then bring back the sample to the command center for further testing. Each team had a different solution for this task. For instance, the team from Brigham Young University used a laser on the belly of the rover that revealed degrees of conductivity in the soil. The data was used to pinpoint the spots where microbes were likely to be present. The light was strong enough to blind onlookers if they got too close, a team member said. But as in other tasks, mechanical snags foiled a number of teams. Missouri scrambled to fix its nonresponsive scoop attachment. Despite last-minute reprogramming, snipping wires and reattaching pieces with alligator clips, their rover failed to do much more than make it a few yards off the starting point. 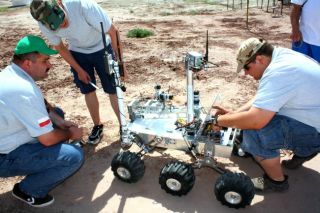 The terrain task tested the mechanical design of the rovers. In this task, suspension systems and wheels could make or break a rover as it attempted to pass through five pairs of PVC-pipe gates placed along the rock-strewn course that included sharp drops and steep elevations. Hyperion stunned the judges with a flawless high-speed run through the terrain course. Given an hour, the Hyperion rover completed the course in less than 12 minutes. No other team was even able to maneuver its rover through all five gates. Oregon State's wheels were the talk of the competition. Instead of using inflatable tires, the team incorporated a simple open metal frame, which gave the rover a significant weight savings and allowed it to perform pretty well on all but the steepest slopes. "The tires were actually a mistake," team leader John Zeller said. "The tires we ordered didn't fit, so we tried just using the frames — and it worked." Oregon State University's rover was the only one with metal wheels. Andersen commended Oregon on being open-minded. "I tell my students to watch their work like hawks," she said. "If something doesn't go the way they intended, they should step back and ask themselves if perhaps it's better. Mistakes can be gifts." This story was provided by TechNewsDaily.com, a sister site to SPACE.com. Follow Leslie Meredith @lesliemeredith. Follow us @TechNewsDaily, on Facebook or on Google+.